Nowadays, pets live a healthier and happier life compared to a few decades back. All thanks to huge advancement in veterinary medicine that safeguards them from numerous diseases and infections. 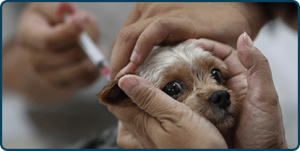 Vaccines play a vital role in improving the immune system of your pets that provides speedy recovery particularly when confronted by any fatal disease or infection.Pet vaccination programs have significantly reduced the animal death ratio. It is advised to take your pets for periodic physical examination and vaccination. At Westheights Veterinary Hospital, your pet’s health is our main concern and preventive medicine is the key to optimal health. Our veterinarians are dedicated to implement their expertise in improving the health condition of your loved pets. Vaccination schedule will be developed according to your pet’s age, lifestyle and health status in accordance with the accepted vet standards. Distemper (CDV) – Widely spread fatal disease leading to vomiting, diarrhea, pneumonia and neurological problems. Parvovirus (CPV) – Most commonly found in young dogs particularly in un-vaccinated dogs. It is a highly contagious disease which leads to severe vomiting and bloody diarrhea. Kennel Cough – It is a contagious infection that affects the upper respiratory tract which may cause persistent, dry, hacking cough. It also contributes numerous infectious agents including adenovirus (CAV-2), parainfluenza (CP), distemper (CDV) and the bacteria Bordetella bronchiseptica. Lyme Disease – This disease is mainly transmitted by ticks infecting both humans and dogs. It significantly harms the joints, kidney and other tissues. Hepatitis (CAV-1) – It is an adenovirus which may damage the liver, kidneys, spleen and lungs. Leptospirosis – It is a contagious bacterial infection that permanently damages the kidney and liver. It can affect both humans and dogs and mainly spread through contact with contaminated soil or water or infected urine. Rabies – It is a fatal infection that can affect both humans and mammals. The virus directly attacks the nervous system and mainly transmitted through the bite of an infected animal. Routine vaccination can only safeguard your pets from this dreaded disease. Viral Rhinotracheitis (FVR) – It is a common respiratory infection found in cats. Sneezing, loss of appetite and fever are some common signs of this infection. Calicivirus (FCV) – It is an upper respiratory infection of cats leading to ulcers on the tongue and mouth. Panleukopenia (FPL) – It is a fatal disease leading to sudden severe vomiting and diarrhea. It is particularly dangerous for kittens. Pneumonitis-Chlamydia (FPN) – Pneumonitis- Chlamydia (FPN) is another type of respiratory infection characterized by sneezing, fever and a thick discharge from the eyes. Leukemia (FeLV) – It is a fatal infection that harms the immune system of the cats and may also lead to several types of cancer. FeLV infection is transmitted through one infected cat to the other. Rabies – It is a contagious infection that affects the central nervous system. It is contagious to both humans and cats. It is transmitted from one infected mammal to another. Routine vaccination can significantly control this dreaded disease. We, at Westheights Veterinary Hospital, organize customized vaccination programs after a comprehensive physical examination. We will keep you updated about what vaccine your pet requires at what time. Our veterinarians ensure long healthy life for pets by managing their vaccination schedule.